What are sensors? You have heard about sensors and about how they are a technological device that is related to computers and smartphones, but in actuality, they are everywhere around us. Sensors are devices that detects some sort of factor of its physical environment and responds by converting the collected data into a display that can be interpreted by humans. The information might be immediately displayed on a screen or sent over network to be displayed elsewhere. There are many different types of sensors. This includes: motions sensors, temperature sensors, touch sensors, and smoke/gas sensors. Motion sensors detect the movement of objects and people, a simple example would be your home’s security device which can detect movement in your house, and send that data to the security system’s control panel, which then delivers the data to a visual monitor. This could be a TV monitor in your home or it could be the screen of your mobile phone. Different type of motion sensors work differently, and it will be useful to know their differences. Passive Infrared sensors detect infrared energy emitted by your body. The active sensor starts by detecting their surroundings and plotting an invisible “grid” or “outline” of the way things are positioned. However, when a person or moving object starts to block parts of a grid, the sensor will be “tripped”, which means that the activated sensor will collect the information inputted. Microwave sensors send out microwaves and measure the reflection of those waves that come off objects or people that are moving. They can cover a larger area than infrared sensors, however, it may not be as accurate because electrical waves can be used to interrupt the sensor. Temperature sensors are commonly used in food processing, medical devices, and handling chemicals. The two main types of temperature sensors are: contact and non-contact sensors. A thermistor is an example of a contact type temperature sensor. 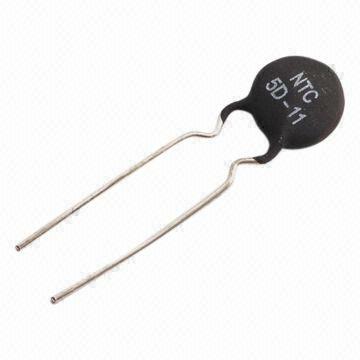 Thermistors are usually made out of material that is really sensitive to temperature and can conduct some electricity. Thermistors are rather common and are inexpensive to purchase. Touch sensors are one of the most commonly seen and used sensors in today’s world. Touch sensors are slowly replacing mechanical devices like the mouse and keyboard that you used to use whenever using the computer. Nowadays, smartphones and even laptop computers have touch sensitive screens. Touch sensors work in a way that is similar to a simple light switch. This is because like a normal switch, when the touch sensor is pressed, the circuit is closed, meaning that the electric current can run through the circuit, and the sensor is tripped. However, when the sensor is no longer touched, the circuit will be open, and the electric current will not be able to flow in a complete circuit. 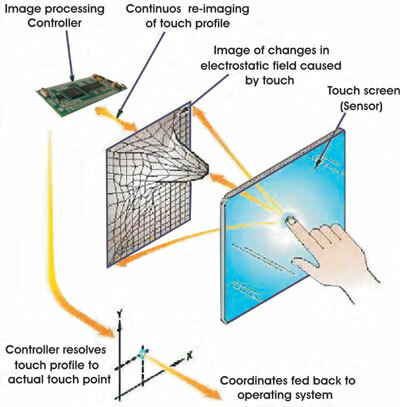 As you can see in the diagram above, when the screen is touched, the data of electrostatic change (a change in electric charge) will be send to the “image processing controller”, which then pinpoints where on the screen you pressed on, and that information will be sent to the operating system. The operating system will then decide what to do with the data collected. If it were the screen of your phone and you pressed the icon of an application on your home screen, the data of your touch will be sent to the operating system, which will then operate the command to open that application.